orzo pasta with salmoriglio sauce is a light and refreshing meal fix! Olive oil with some garlic, lemon juice, zest and fresh parsley — salmoriglio is my quickest pasta sauce recipe. Toss it with some hot pasta and grated parmesan cheese and you’ve got yourself an exotic sounding “orzo pasta with some Sicilian salmoriglio sauce” entrée. This sauce now sits along side my creamy avocado pasta sauce recipe for an easy and delicious pasta sauce recipe. I love the flavours in this sauce. fresh parsley, lemon and garlic. They all blend together so well and not to forget the melted parmesan in the pasta. I also added some roasted cherry tomatoes to add a little colour and because I just love roasted tomatoes. Sahl-moh-ree-lyee-o – it took me some time to even pronounce it correctly :-). It is a bit pungent with minced garlic but if you don’t like a strong garlic-y flavour, you can control that by putting in crushed whole garlic cloves. 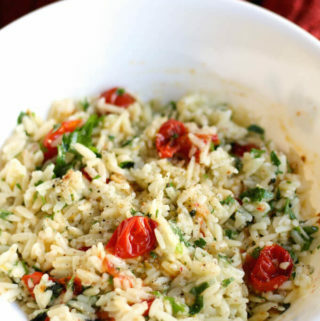 Not only is the sauce a quick recipe, orzo must be one of the fastest cooking pastas. At first when I saw orzo pasta in the supermarket, I thought it must be a different kind of rice but it actually was a rice-like pasta! I wonder what led Italians to invent so many different shapes of pasta! Someone must be getting really bored! 🙂 But hey, we got so many different dishes because of that. So guys (and girls), keep on inventing! Light and refreshing this orzo pasta with salmoriglio sauce is a quick meal fix. 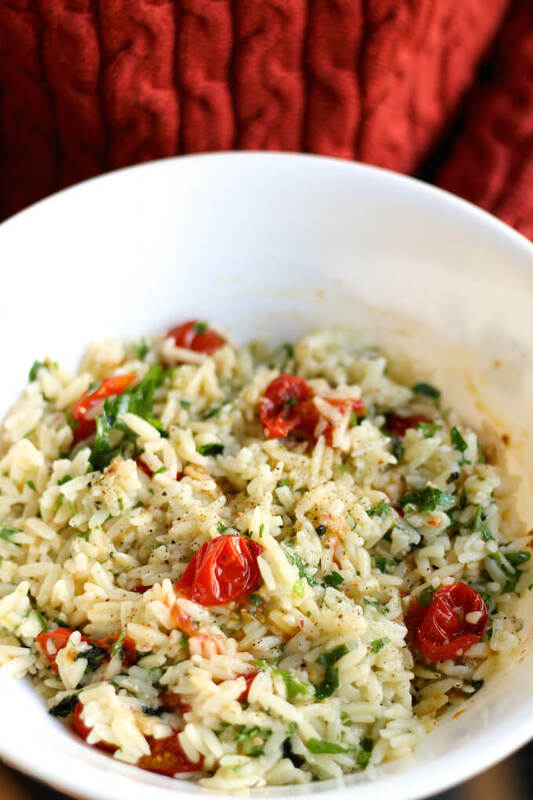 Orzo is a rice-like pasta and goes great with the simple Salmoriglio sauce which is a super easy with olive oil, garlic, lemon and parsley. Great as a main or a cold appetiser. Add 1 tsp olive oil and salt to the water. Throw in the orzo pasta to cook until al dente. Takes about 8-10 mins. Cut the cherry tomatoes in half, drizzle with a little olive oil and grill for 10 mins. Heat the remaining olive oil in a pan, add the minced garlic and sauté for a couple of mins till the garlic starts to brown. Remove from heat, add zest and juice of one lemon. If you want a more garlic-y flavour, simply crush and peel and add whole garlic. Add salt and pepper. Finely chop the fresh mint and flat leaf parsley. Now drain the orzo into a bowl. Grate the parmesan cheese on top and mix it all well so that the heat of the orzo starts to melt the cheese. Now add the hot sauce, the fresh herbs and the roasted tomatoes. I love the burnt garlic flavour so I cook the sauce till the garlic browns but if you prefer raw garlic, just cook the sauce for a minute or so. The pasta can also be served as a cold appetiser. Olive oil really adds to the calories in this recipe. I mean with 1 tbsp giving 120 calories, I really try to go frugal on oil in most recipe but this one just has that as the base!